Amazon USA, Amazon UK, Barnes & Noble, WHSmith, Casemate USA, Casemate UK, for varying prices, depending on where you will order. Click on the above names for a direct entry to your favorite online seller’s web shop to order the book. 26 CUSTOMER REVIEWS ( Most are 5-Star) found on the Amazon USA page, 10 more REVIEWS found on Amazon UK. You should read those amazing Customer Appreciations. Mr. Wiesman not only manages to convey his love for this venerable aircraft, but provides the wannabe World Traveler with valuable insights. 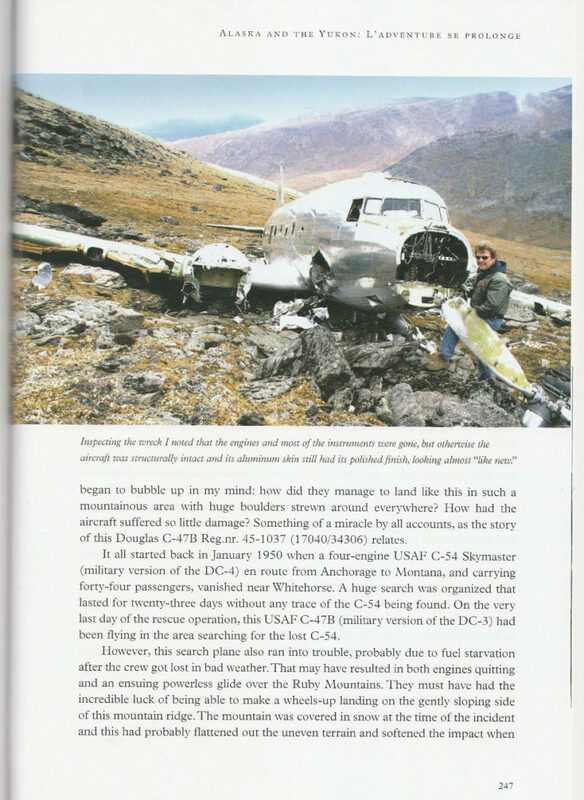 A must read for the Aviation Enthusiast and those whose work or passions may lead them down paths less traveled around the globe. 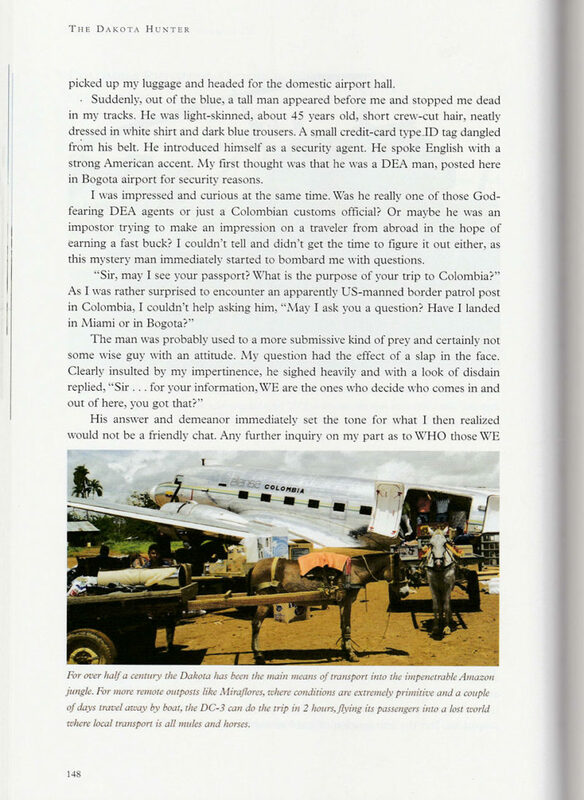 This book is about a Dutch boy, who grows up during the 1950’s in the wilderness of post-war Borneo, where he has frequent encounters with a plane of WW II fame, the Douglas DC-3, (aka C-47, Sky truck or Dakota). For a young boy living in a small remote jungle community, soon the aircraft reaches the proportions of a romantic icon, as the essential lifeline to a bigger world for him, the beginning of a special bond. After graduation from University in Holland in 1975, he starts his career as a corporate creative executive, and meets the aircraft again during many business trips to the Americas in the 1990’s in Miami and on the Caribbean Islands. The childhood passion for the Dakota flares up and this fascination begins to pull like a magnet. As if predestined or maybe just looking for an alibi to come closer, he starts in 1999 with a partner an odd business to salvage and convert surplus Dakota parts to designer furniture and high-end interior objects/ collector’s items. 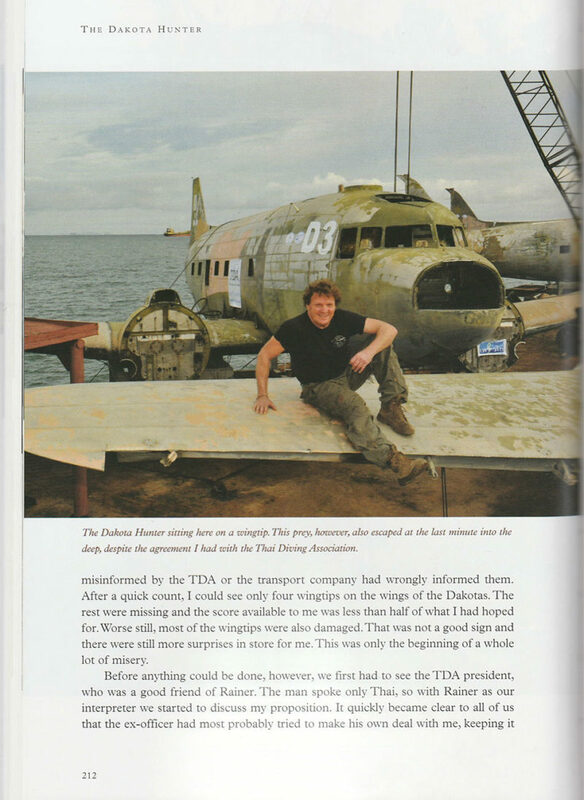 As the demand for those war relic parts and cockpits soars, both from collectors and museums, he travels the world to scout and track down surplus, crashed and derelict Dakotas. He ventures deeper into remote mountains, jungles and savannas, where the planes are to be found, still in operation or perished. Wherever he goes to scour the mythical Dakota lost in the mist of legends, he encounters often intimidating, dicey or outright menacing situations in countries like Madagascar, Bolivia, Colombia, Venezuela and Honduras. Some places are plagued by wars or revolts, others by arms & narcotics trafficking militias, warlords, colonels and con men. Many of those players try to levy him or put pressure on his dealings. 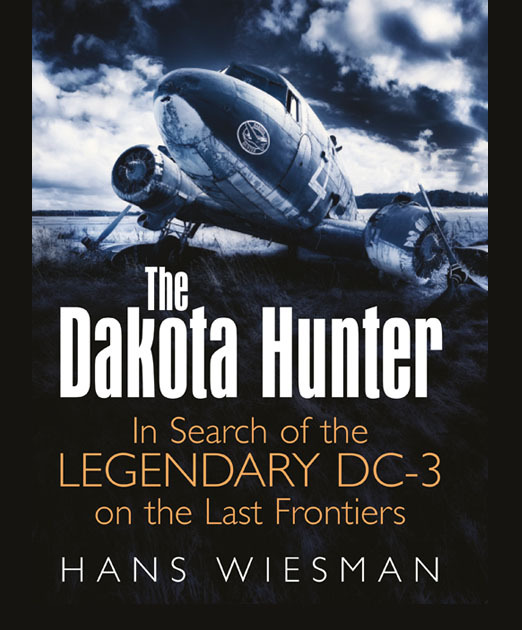 The Dakota Hunter tries to dodge or deal with them, in order to get his trade out of that jungle to Europe: an effort that sometimes takes years and quite often brings no results at all. Covering a 20 years time span, the 11 chapters of this book describe the authentic reflections of his multiple expeditions, all unequivocally exposing the determination to pursue his passion and to follow his novelty and adventurous spirit to go beyond the known horizons. With a craving for the jungle and a unique expertise of the plane’s whereabouts, he narrates his ventures with entertaining zest. Stories packed with intrigue and plots that unveil one surprise after the other. 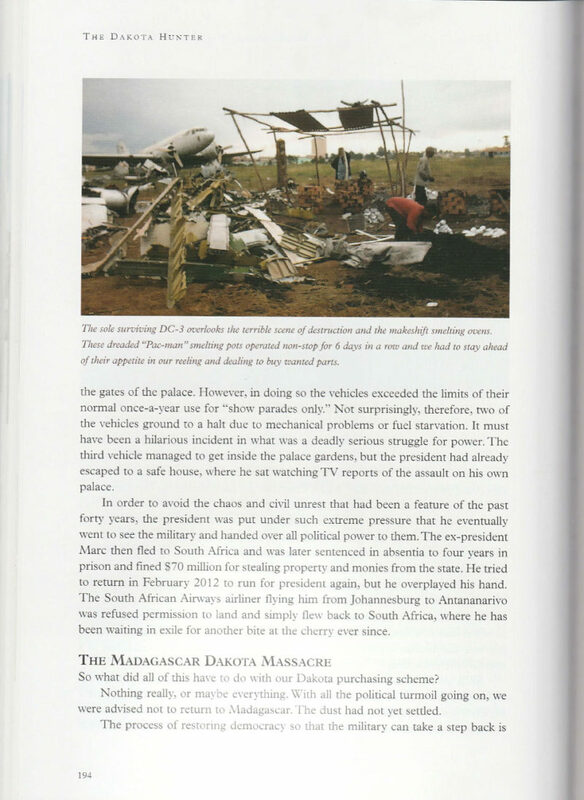 Often with a pitch on humor and driven by a strong curiosity for the political, military and cultural environment of the countries visited, it makes the book fly far beyond the limitations of an “Aviation” or ‘Pilot” related book. From its Maiden flight in 1935 to its current status, at the 80th anniversary of the aircraft. 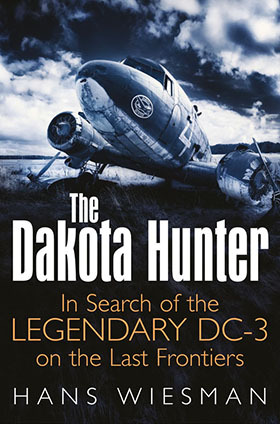 Prologue, The genesis of the fascination for the Dakota. After a near fatal accident in Borneo, it is that aircraft that flies him out to a hospital as an ambulance. 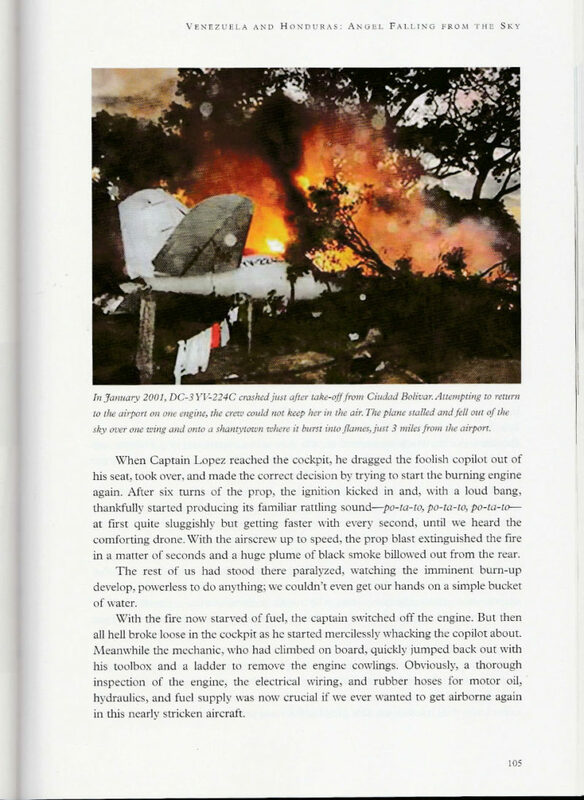 The plane reaches iconic proportions, resulting in a passionate relationship playing up later again in his turbulent life. The first years of the encounters with the Dakota in Borneo, the weird living in remote jungle posts where the search for oil has brought his family. Encounters with wild animals and the left overs from a war in the Pacific, that turned out to be the beginning of a fascination for adventure and travel. Chapter 2, Holland, In the beginning. In 1957 returned to Holland, a 7 years itch at a stringent Jesuit College brings discipline in the life of a maladjusted Jungle Boy. He enters University and leaves as a graduate in 1975, He accepts a global travelling job that brings the Dakota back in view. By the year 2000, he has started a business from this passion and the first limited series of Dakota wingtip desks is produced and sold, the global quest for the Dakota is about to start. Chapter 3, U.S. Gulf States- Jackpot & Quicksand. First scouting trip to the US Gulf States brings a load of new experiences and a good starter inventory for the emerging business of designer furniture made from DC-3 parts. The search for the aircraft gets a broader focus, the quest in South America starts. Visiting the Dakota communities of third world nations brings new challenges and first encounters with crashed aircraft and the military. Those jungle adventures make the passion stronger than ever but not more successful in numbers; zero results from this trip. Chapter 5. Bolivia – El condor pasa. 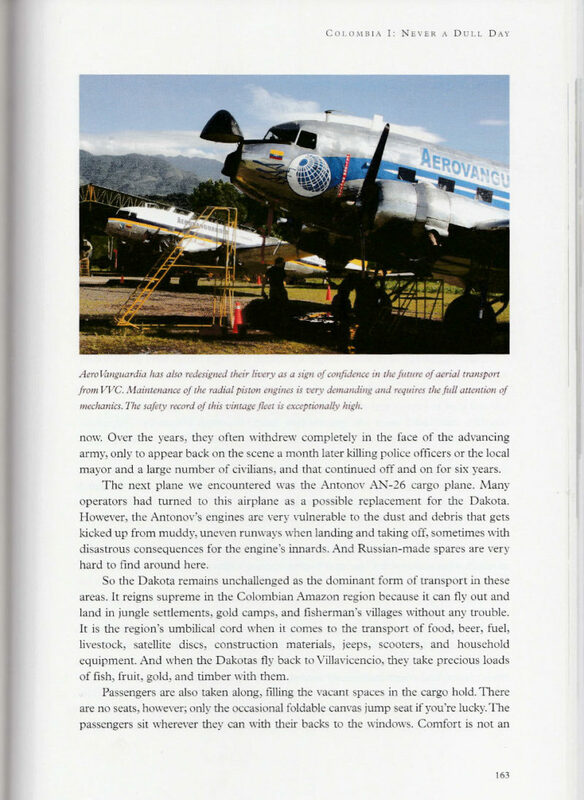 The High Andes is a rich resource for vintage aircraft, with the aerial meat transport in this poor country. Stunning landscape, heart stopping flights and altitudes, but the results are meager, and it takes years to get the crop out to Europe, but what a combo, Jungle and High Mountains. Chapter 6, Colombia I – Never a dull day. A most harrowing story about a confrontation with a DEA agent and a scary jungle taxi ride to the southern frontier town Villavicencio. Nothing to buy yet; fears for Farc terror all over the place and encounters with new relations; it was too early for business. An eventful and dangerous trip to the Capital of DC-3, a “war on drugs” theater in which Dakotas play an ambiguous role. Chapter 7, Madagascar- Dancing with Colonels. 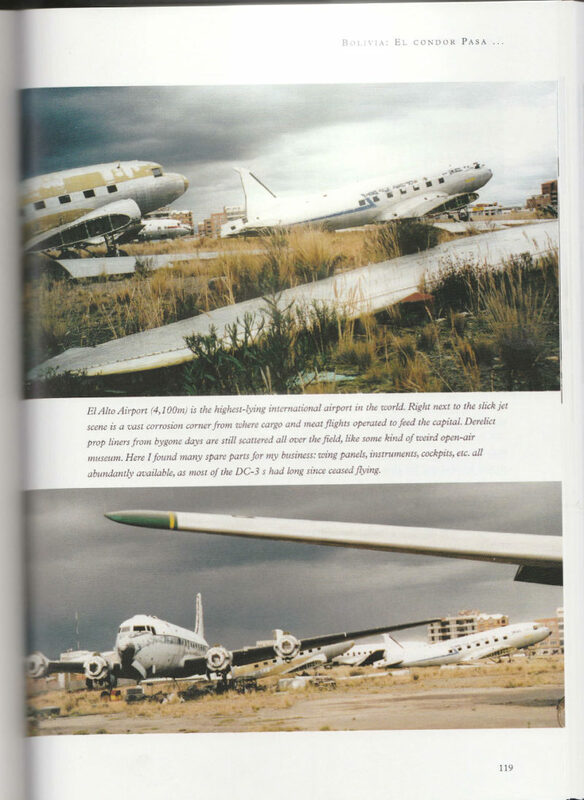 Another most amazing story about an African Air Force ghost fleet: 22 aircraft for sale in the midst of a struggle of Military against Government. Revolt and uprising, here we came too late for business. All aircraft chopped up in a surprise bone yard massacre. The wingtips were salvaged in the final act but yet a long way to go to get them over to Europe; too early for a victory dance. 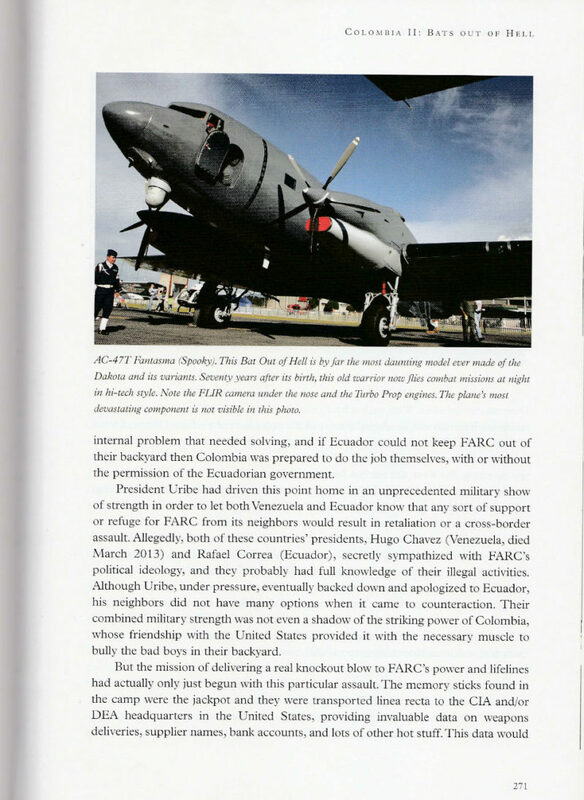 Chapter 8, Thailand/ Phuket – Sinking the Dakota. Another conflict with the Military involved, but more remote. Five Dakotas to be sunk for an artificial reef /divers’s paradise and a contract to remove wingtips before sinking. That results in an uprising of the local divers a midst a smoldering bribery scandal. The US military strike back in a final act: no wingtips recovered from that James Bond island of Phuket, but the finale of this story brings a surprise and a stunning end of the tale. All Dakotas are now washed from their submarine burial place, it was all in vain. Chapter 9, Alaska & Yukon- L’aventure se prolongue. In God’s own backyard, there are still many vintage aircraft operational in Anchorage, Fairbanks, and Palmer. A dazzling trip of unparalleled beauty, but hardly any wingtips found, all sources dried up. But the Yukon unveiled the “Titanic” of crashed Dakotas, in an unparalleled scenic mountain setting, we encountered rhe luckiest crash ever made in wintertime where the 10 men crew survived.. Our victory came on the last day in Canada, where Joe McBryan of “Ice PIlot” fame unveiled in an old hangar 12 wingtips for sale from the Buffalo Airways history. Chapter 10, Colombia II – Bats out of Hell. Old relations revisited in a new Colombia, with Farc running on its final legs. Encounter with a hidden jungle helicopter base, from where they fly patrols at night. Dakotas fly in the food and fuel, tables have turned now and the C-47 is even out on nocturnal combat missions as a “Spooky”, a war veteran of 70 years old still fighting! Business galore with 12 wingtips found from crashed and seized Dakotas. Transport to Europe took another year of work. Read about the flights to isolated Amazon communities, to find more perished Dakotas, most exciting and promising for future finds! Chapter 11, Museums & Projects, Icons of Victory. 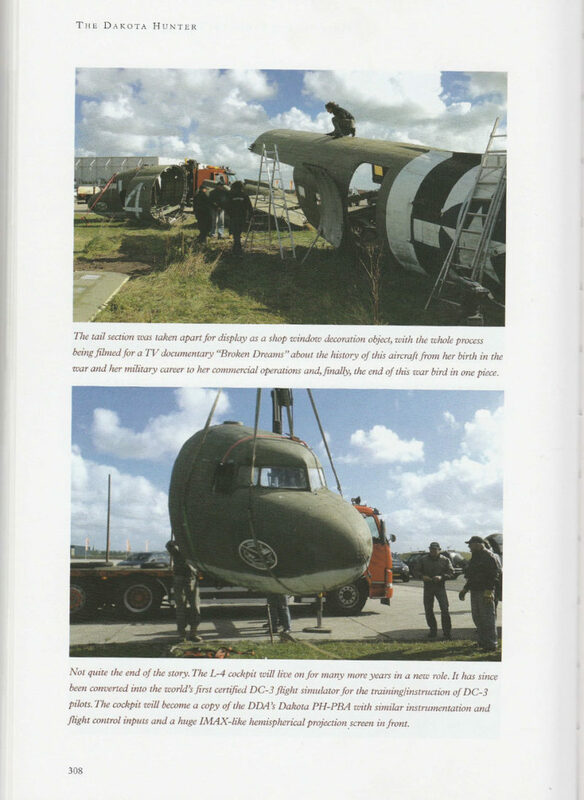 Final stories about searches for museums, A well documented WWII veteran C-47 found in a Florida swamp is put on transport to Holland. Another Dakota Musical star in spe, unfortunately trashed during its transport. New projects with displays in Holland with the World’s first certified DC-3 Flight Simulator and in Normandy , France and many new adventures to come overseas.